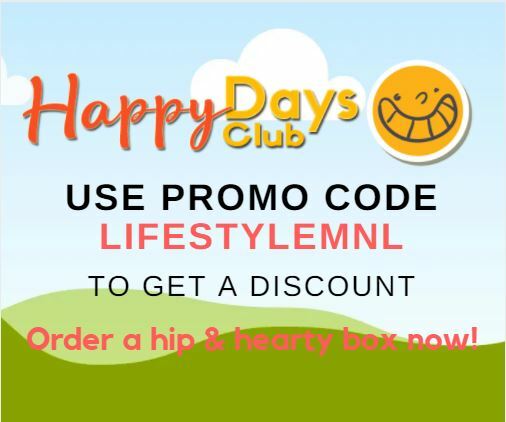 My husband and I have always adored beef–burger, steak, bistek Tagalog, you name it! 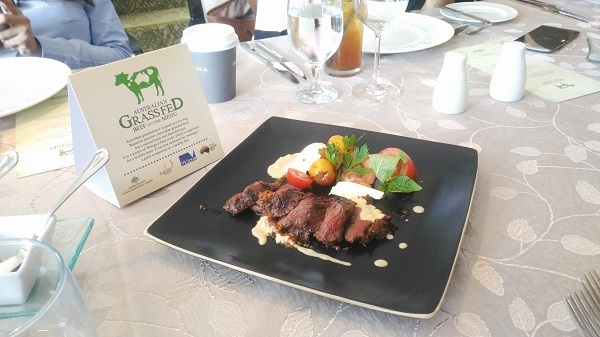 So much so that I did not pass up the chance to join the Australian Beef Embassy’s culinary trail promo last week. The promo showcases the delectable Australian Grassfed Beef, naturally low in cholesterol and high in Omega 3 fatty acids, making it arguably better than the beautifully marbled Kobe and Wagyu varieties. Being a Mandaluyong resident, I picked the trail where I only had to go around the Makati-Mandaluyong-Ortigas area. Out of the 41 dining spots offering Australian Grassfed in the Philippines, I got to visit five in one day! Details about the trail below! Roast Beef Marmalade (Php420) which is made of tangy sweet pulled beef and onions slathered on crostini slices and topped with pickles. For pasta lovers, there’s the Braised Beef Ragu (Php560, pictured above), made of slow-cooked beef shank ragu ala Milanese mixed with tender pappardelle and Italian spices and topped with some savory tendon puffs. The tendon puffs are delicious, though sparse! The Natural Beef Hash (Php490) meanwhile has some fairly-tender slowly-braised grassfed beef mixed with heirloom tomatoes, chopped bell peppers, onions, parsley and tomatoes and topped with some tangy-sweet basil pesto, poached eggs and parmesan cheese. If you’re into steaks, try their Rib-eye (Php1600) with flaky sea salt and sweet bone marrow butter. This dish is served with tabbouleh salad (kale greens). My favorite among the bunch is the tender Roasted Beef Short Ribs (Php1800) which is, despite the steep price, a must-try! Served with red rice, green shallot kimchi and jalapeño puree that tastes like creamy mashed potatoes, the dish can probably easily fill up more than two people. 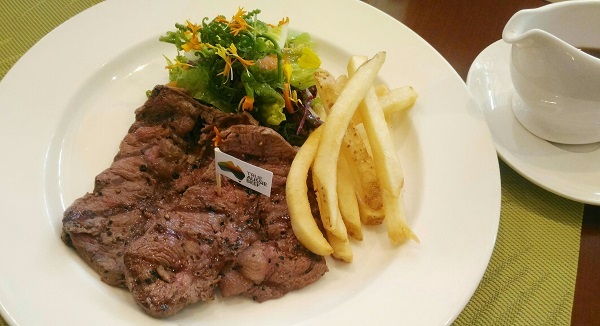 Discovery Suites’ steak restaurant proves that good beef needs careful preparation with its three offerings: Steak and Tomato Salad (Php800+), Oven-braised Short Ribs (Php1150+) and Sous Vide Grass Striploin (Php1200+). In the Steak and Tomato Salad (pictured below) the Australian skirt steak had first been marinated in sake before being grilled and served with heirloom tomatoes, basil and feta cheese with extra virgin olive oil. 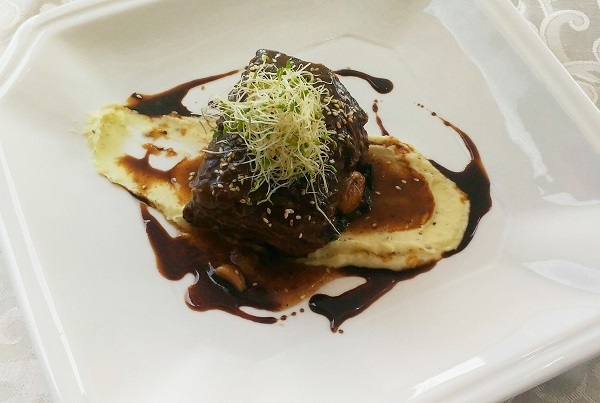 The meltingly tender, boneless Short Ribs (pictured below) had been slow-cooked for several hours in a rich stock before sliced and served with seaweed puree and wilted garlic spinach. This is divine, and yes, highly recommended! Last but not the least, the Sous Vide Grass Striploin had been, as the name implies, cooked sous vide style to ensure that its flavor remained intact. The striploin dish is served with roasted potatoes, mushroom ragout, asparagus and slathered with some sambal hollandaise. Mushroom cappuccino (Php290+), a rich concoction of mushrooms, cream and truffle foam, served as a great appetizer to start off the meal at 22 Prime. And of course, not to be outdone, the Dark Chocolate Marquise, the restaurant’s signature dessert made of dark chocolate mousse, English cream and saccharine pistachio bits, did not disappoint as well. Papa Diddi’s, the newly established dining haven that good local produce built and a farmer lawyer inspired, offers two delectable dishes made from locally sourced ingredients. And each dish only costs Php280 a pop! No need to go all the way up north to taste the pride of Cagayan! Papa Diddi’s take on the local favorite, Pancit Batil Patung, is just as filling and chock-full of tasty ingredients as the original. This version though is made of handcrafted linguini noodles mixed with bagnet, Australian ground beef, beef broth, cabbage, onions, spring onions, and topped with a poached egg. The broth makes this hearty bowl of goodness. If you’re up for some party in your mouth, spend your Php280 on Papa Diddi’s Fusion Burger (pictured above)! 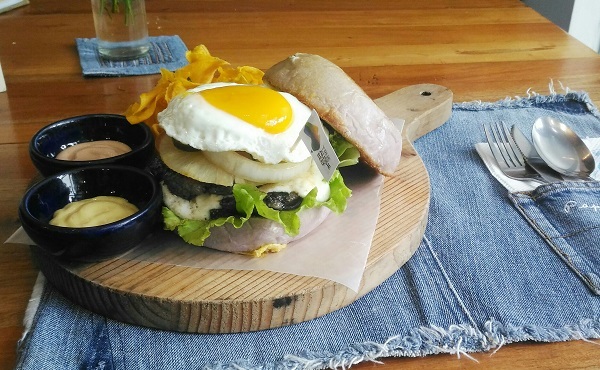 It’s made of Australian grassfed beef burger, banana blossom burger(!!! ), lettuce, a thinly-sliced pineapple ring, a (runny) sunny side up egg, pickles, kesong puti and honey mustard. The lightly toasted bun comes in three flavors: Ube, Malunggay or Pandan. You get to choose which one to try, and since I’ve only been able to try the ube and malunggay variants, I can’t vouch for this, but the owner prefers the pandan bun. Personally, I like the ube bun as is or with Papa Diddi’s delicious ice cream. The crispy sweet potato chips on the side taste light, low-cal and heavenly too. By now, my tummy was already full, but I knew I still had to go on and experience how the two other restaurants on the trail bring out the beefy flavor of real Australian grassfed. And thankfully, we reached Chef Jessie Sincioco’s Pasig resto, which is already known for setting Pasig ablaze (figuratively of course) with her little bro in the kitchen! Their three latest creations bring out the savory, slightly gamy flavor of the happily grazing cows of Australia. The Charcoal-Grilled Grassfed Oyster Blade Steak (Php1,000 + 10%, pictured below), for instance, may be featuring an unusual cow part, but has a strong flavor and a tender texture. It tastes great with the accompanying mustard sauce, mesclun green salad and French fries. The fries, I’d like to note, taste nothing like I’ve had before–they’re cooked through, not oily at all, and tastes like it’s been soaked in a good dose of saltwater before fried. Not sure if they’re homemade either–never got to ask the Chef herself, and they taste light–but I guess you’ll just have to try them for yourself! The Charcoal-grilled Beef Striploin Steak (Php1,400 + 10%), meanwhile, comes tender, hearty, and medium rare to preserve the delicious beefy flavor. It’s served with grilled leeks and potato wedges. Another favorite, the Slow-Roast Grassfed Beef Cheeks (Php1,000 + 10%) is one dish that features tender and flavorful beef cheeks–another unusual cow part–that one can easily chow down in one sitting. This dish is served with poutine (fries and gravy) and sauteed spinach. Beef Fajitas (Php349), a delicious make-your-own appetizer dish made with Australian beef strips, bell peppers and onions. 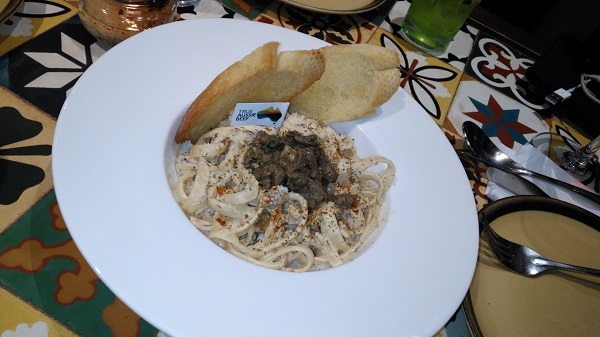 Fetuccine Stroganoff (Php399, pictured below), a pasta dish that’s loaded with strong beefy flavor. 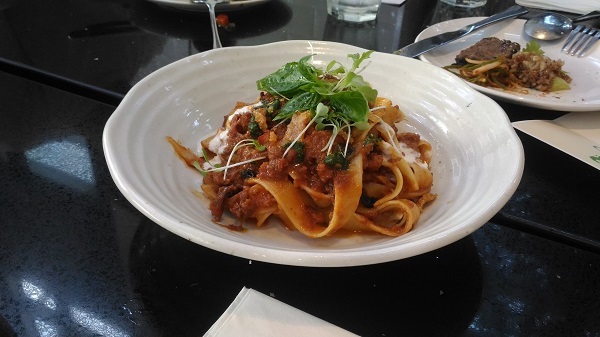 The pasta is al dente, sauce creamy, and beef savory. You can taste the cow in every bite. I soon realized why the favorite beef at home is a little on the pricey end. But with a bunch of restaurants in Manila (and Cebu and Davao, mind you) offering grassfed beef on the menu, I don’t have to spend hours in the kitchen all the time anymore. Huzzah! 8 Cuts, Abuela’s, Blackbird, Bondi & Bourke, Carpaccio Ristorante Italiano, Chef Jessie, City of Dreams’ Crystal Dragon, Dean & Deluca, Discovery Primea’s 1824, Discovery Primea’s Flame, Discovery Primea’s Gilarmi Lounge, Discovery Suites’s 22 Prime, Downtown & Halsted, Epicurious, Green Pastures, Hyatt City of Dreams’s The Cafe, New World Manila’s The Fireplace, New World Manila’s The Marketplace, New World Makati’s Cafe 1228, Papa Diddi’s, People’s Palace, Pink’s, Prime 101, Sala, Sala Bistro, Shangri-la The Fort’s Raging Bull, Smith & Butcher Grill Room, The True Grill, Vask Tapas Room, Wildflour and Dusit Thani Manila’s The Pantry.